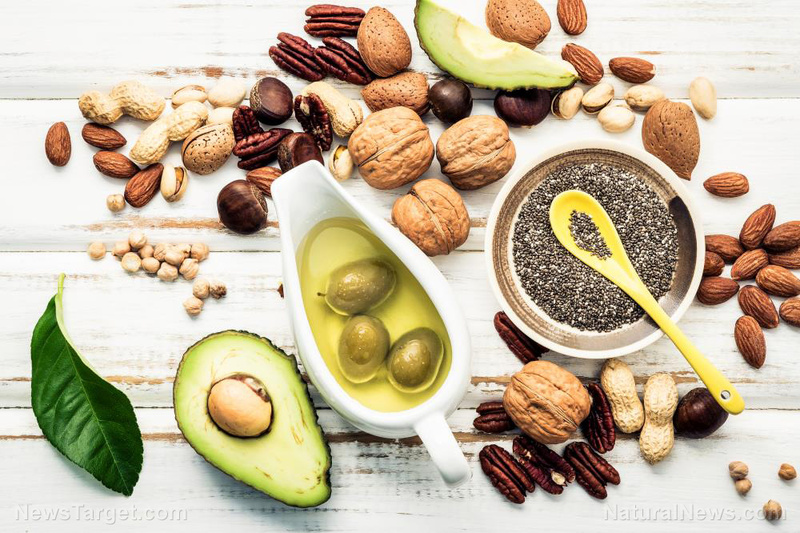 (Natural News) Contrary to popular belief, fats could be healthy, depending on its source. For example, fats from processed foods, fried foods, and baked goods are harmful to your health. On the other hand, fats found in natural foods are actually healthy and nutritious. Here are some of the healthy high-fat foods you need to include in your diet. Olive oil: Many studies show that olive oil can lower your risk for cancer, diabetes, and heart disease. It contains compounds called oleic acid and secoiridoid that slow the aging process. When buying olive oil, choose extra virgin olive oil because it is extracted using natural methods. Fatty fish: Fatty fish – such as anchovies, herring, salmon, and sardines – contains omega-3 fatty acids, which are great for keeping your brain healthy and fighting inflammation and chronic disease. Eggs: Eggs are thought to increase cholesterol levels, but research has proven that cholesterol from eggs does not really affect a person’s cholesterol levels. In fact, eating eggs for breakfast can make you feel full and satisfied for longer periods. Nuts: Nuts are rich in nutrients like amino acids, vitamin E, and unsaturated fatty acids. Research shows that eating an ounce serving of nuts every day can lower your risk of diabetes, heart disease, and stroke. Nut butters, such as almond, cashew, and peanut, also contain healthy fats that can help you feel full and satisfied. Just avoid nuts and nut butters that have added ingredients, such as sugars or vegetable oils. Coconut oil: Coconut oil had a bad reputation because its calories mostly come from saturated fat. However, the main type of saturated fat in coconut oil is lauric acid, which has anti-inflammatory and antibacterial properties. Additionally, coconut oil contains medium chain triglycerides (MCT) which can be used as an immediate source of energy. Dark chocolate: Dark chocolate is a great source of good fats and keeps the heart healthy. Research shows that good gut bacteria feast on dark chocolate, then they grow and ferment it, which produces anti-inflammatory compounds that are good for your cardiovascular health. Moreover, eating dark chocolate can help you maintain a healthy weight. Greek yogurt: Greek yogurt contains 70 percent saturated fat and a gram of a naturally occurring trans fat called conjugated linoleic acid (CLA) that may help prevent chronic diseases. Olives: Olives contain high amounts of oleic acid, which is the monounsaturated fatty acid that keeps the heart healthy. Olives are also loaded with antioxidants that protect the cell from damage, as well as copper, fiber, and iron. Seeds: Seeds may be small, but they are packed with nutrients. Seeds like chia, flax, hemp, pump, and sunflower are loaded with monounsaturated fats like omega-3s, which fight inflammation. They also contain good amounts of fiber, protein, and vitamins and minerals like vitamin E, iron, and magnesium. Soybeans: Soybeans are rich in protein, fiber, isoflavones, and essential fatty acids, making them a great fiber-rich meat substitute. Organic cheese: Research shows that eating cheese regularly can reduce the risk of high LDL cholesterol and heart disease. Aged cheese also contains probiotics, which aid in digestion and weight loss. This food also contains phosphorous, protein, and calcium. Moreover, cheese increases levels of butyric acid, which has been associated with lower obesity risk and a faster metabolism. Overall, the body needs some fat from food. It is a major source of energy and is needed to build cell membranes and the sheaths surrounding nerves. It also helps you absorb some vitamins and minerals and is important for blood clotting, muscle movement, and inflammation. Read more stories on what foods should you eat for better health by going to SuperFoods.news.